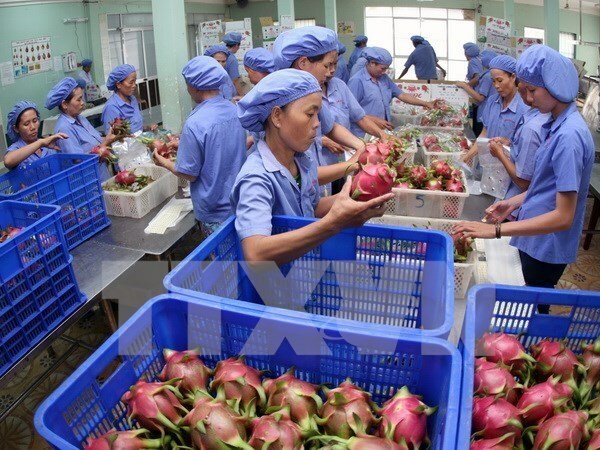 Can Tho (VNA) – The Mekong Delta’s fruit export revenue will surge in the next few years, said Nguyen Phuong Lam, Deputy Head of the Vietnam Chamber of Commerce and Trade (VCCI)’s chapter in Can Tho. The region has approximately 288,000 hectares of fruit crops, which produce 3.5 million tonnes of products per year. The delta accounts for about 38 percent and 44 percent of the country’s fruit plantation and production, respectively. VCCI Can Tho sees that the conclusion of the Trans-Pacific Partnership deal and free trade agreements that Vietnam sealed in 2015, such as those with the Republic of Korea, the EU and Russia, will bode well for the region’s fruit exports. The formation of the ASEAN Community should help, as well. To capitalise on future opportunities, the major drawback that local enterprises need to work on is their loose connection with farmers in both production and distribution, Lam noted. Nguyen Van Nguyen from the Southern Steering Committee said these businesses ought to update their knowledge about integration and enhance their competitiveness. He underscored that the community will need support to collect market information and promote their products. According to the Southern Fruit Research Institute, 85 percent of fruit harvested nationwide is consumed domestically and many of them have to compete with imports from the US, Australia and Japan. Concerning the delta’s rice production, despite difficulties in early 2015 due to narrowed Asian markets, rice exports increased by the year’s end. Last year, the region shipped 2.37 billion USD in rice overseas. The upbeat records for rice and fruit could enable the Mekong Delta to welcome an influx of Japanese investment, which is expected to boost agricultural management and technology in the region. As such, the region aims to form new business sectors in IT, logistics and biotechnology, among others.